: Add two mana of any one color to your mana pool. Spend this mana only to play artifact spells or activated abilities of artifacts. stellarstormtrooper66 on Don't Touch! It's Art! 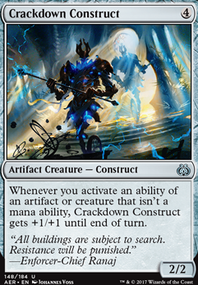 I think it would be a good goal to get the average CMC under 4 mana, high CMC cards I think that could be cut without interrupting your combos or synergy are: Ancient Stone Idol, Scuttling Doom Engine, Darksteel Juggernaut, Soul of New Phyrexia. I think this deck really needs more low CMC color fixing ramp, the best being something like Fellwar Stone, but adding several signets would be an easy idea as well. When it gets to the late game and you don't need them anymore, you could just sacrifice them to Breya. Also, if you have a Chromatic Lantern, it deserves to be in this deck over any other deck you own honestly. 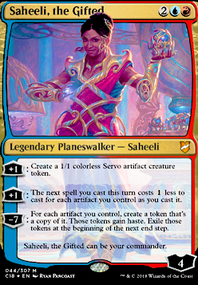 Unless you build a 5-color deck, it really should be in here. 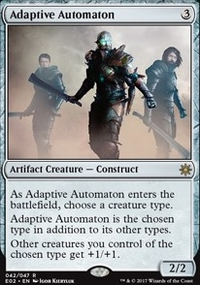 Other cards that could help with color include: Vedalken Engineer and Chief Engineer. I would consider some budget lands to better improve mana fixing: Spire of Industry and Exotic Orchard would be awesome. Tri-lands are a decent option such as Arcane Sanctum. I know they enter tapped, but rainbow production from these lands feels great: Gateway Plaza, Transguild Promenade, and Rupture Spire. If you have (or know someone with) a Padeem, Consul of Innovation, that could be great. Both card draw and protection feels great on one card. 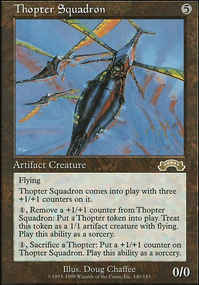 Storm the Vault would a fun card in a deck like this as is Bident of Thassa when you take into account your thopters. 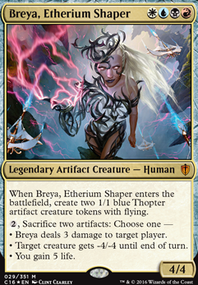 Blicking Breya at instant speed is good also because her effects can be used regardless of summoning sickness, so you can surprise someone with her effect when low on artifacts to sacrifice: Cloudshift, Ghostly Flicker or Deadeye Navigator. The cool removal spell I was talking about earlier is Dispatch. I'm not 100% certain, but I might have a spare Slobad, Goblin Tinkerer which would be great here as well. Overall, looks really strong, I think all it needs is some simple cards to improve consistency. Soldevi Machinist, Vedalken Engineer and Renowned Weaponsmith are actually powerful in this deck as well Arcum Dagsson is way too powerful. Sunstone is kinda silly but it will save you a few games sometimes. Alright, this thing looks absolutely filthy. 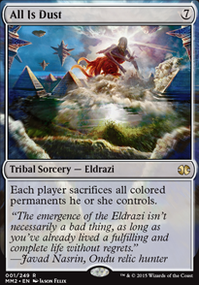 I love any infinite energy mechanic that doesn't involve Felidar Guardian. Bravo. There's an infinite combo around Shrine of Piercing Vision in here. If you arrive at a board state where you have an infinite untap combo up and running and a non-land way of generating mana (either Vedalken Engineer or the Grand Architect + Pili-Pala ), but do not have the Consulate Turret, you can put infinite charge counters on Shrine of Piercing Vision. 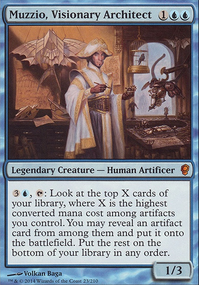 This means you can tutor for anything and (most importantly) put all the other cards on the "bottom" of your library in any order, which would end up being the top if you go through your whole deck. This would also let you tutor for a clutch counterspell and instantly cast it if your board is threatened. It's a good defensive combo to have available, particularly since you can tutor your way to going "shields up" with an Isochron Scepter + Mana Leak . I think your deck needs some form of ramp, since Panoptic Mirror costs 5 and Chandra, Flamecaller costs 6. For the Mirror you can leverage Vedalken Engineer or Renowned Weaponsmith since it is an artifact. More generally Desperate Ritual, Pyretic Ritual or Simian Spirit Guide can speed up your plays. Without the ramp you really won't do much until turn 5 and that isn't a good place to be in Modern. Hope this comment is of help, good luck brewing your deck. PookandPie great cut choice's I agree with them all. Cut Hellkite Tyrant, Vedalken Engineer and Dismember. I don't own Muddle the Mixture and Rhystic Study but do have Path to Exile. Reckon Mind's Eye is a good replacement Rhystic Study? Does Panharmonicon trigger Deadeye Navigator soulbond twice? IE can I soulbind and flick two separate creatures? Since you have Mycosynth Lattice, why not Karn, Silver Golem? The main strategy I'd go with is generating large amounts of artifact tokens/creatures to win with either riches or crazy recursion loops with giant beaters, sacking a few myr or thopters with something like Champion of Stray Souls to bring back all your giant beasties. This is just a bunch of possible options that would help with that strategy.